Does harried mayhem ensue? Damn straight! You don't put monkeys in an ad for any other reason. They scamper and explore, trying out all the fixtures and climbing into every cabinet and drawer. At one point, a fridge full of bananas bursts open, much to the cast's delight. 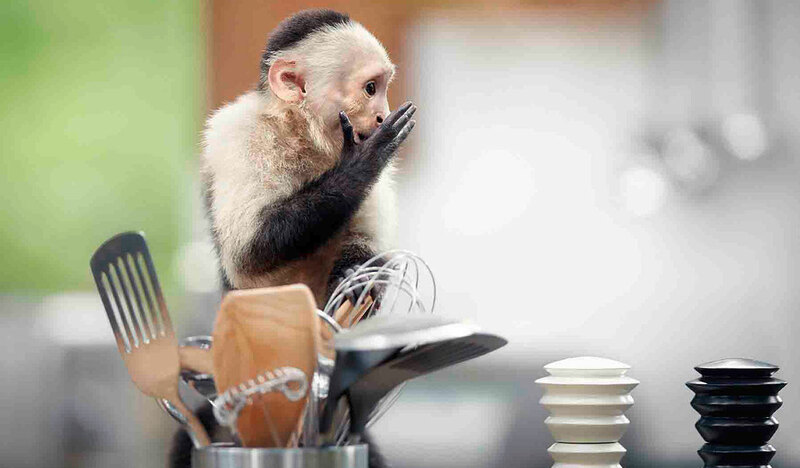 "We know there's fun to be had for all the family in the kitchen, and we hope these cheeky monkeys will help people experience that for themselves," says Peter Wright, marketing manager for Ikea in the U.K. and Ireland (which is fond of animals stunts like these, having thrown 100 cats into a commercial a few years back). Ultimately, a shattered coffee cup brings the jungle shenanigans to a halt. Monkeys have failed at java prep in ads before, notably in this Costa coffeehouses spot from a few years back. I guess they haven't evolved much since then. You'd think things would go more smoothly for Ikea, though, with all those capuchins on hand. See what I did there? I'm the cheeky monkey! Check out the behind-the-scenes clip below, which clearly aims to disarms critics who frown upon the use of monkeys in ads—by playing up Ikea's involvement in the rescue center.